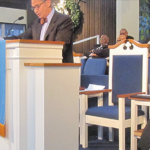 Rabbi Doug Alpert said the theme for this year’s Martin Luther King Jr. remembrance, “It’s Time,” is not an invitation to look back, but to ask what God requires of us now in the fight for racial equality. “We don’t have peace unless we have wholeness unless we have a complete community in a state where every voice is heard, where every person has dignity, where every person is treated with justice and respect,” Rabbi Doug Alpert of Kansas City said. The message according to one member wasn’t just for Trump but also for the masses. “This is not just specific toward the administration but the policies that they are attempting put forth are particularly unjust,” Douglas Alpert, a Kansas City rabbi said. On this edition of Up To Date, we hear from a diverse panel of community members, activists and police about how these tragedies affect us here in Kansas City. … calls for an independent monitor to review the actions of Kansas City police. … are victims of police involved shootings,” said Rabbi Doug Alpert of MORE2. Officials of an interfaith organization on Sunday called on Kansas City police … Rabbi Doug Alpert of Congreation Kol Ami called the numbers “very disturbing.”.